On Sale Now! Free Shipping Included! Save 8% on the Elecasport Wireless Charger Kit, Wireless Charging Pad, Receiver Adapter Module for Any Android and Old Version iPhone 5/6/7/8 - 4 Piece by Elecasport at DJ Luu. MPN: Elecaspo. Hurry! Limited time offer. Offer valid only while supplies last. What is the advange: If you do not have latest iphone, such as iphone 8/8plus/x , samsung galaxy s7 s8 s6 s5 , you can buy these charing kit . 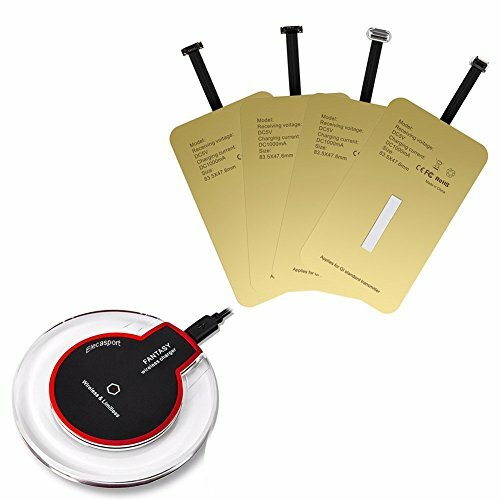 What is the advange: If you do not have latest iphone, such as iphone 8/8plus/x , samsung galaxy s7 s8 s6 s5 , you can buy these charing kit . Receiver iphone is suitable for any iphone and android phones. Because of including different charing receivers specifications: Input: Dc 5v/2a output: 5v/1a wireless distance: 6, 8 mm , means if the case is less than this thickness . It also can charge over the phone case. Conversion: 75%a applicabie devices: 1. Devices with built-in wireless charging receiver (nokia 1520 , lg, nexus 5 and more) . 2. Devices with reserved wireless charging interface beside it battery （samsung galaxy s3 s4 s5 note2 note3 note4 etc ） 3. Devices with wireless charger receiver in its protection case (iphone5/5s, iphone6, iphone6 plus, etc) charging kit package included: 1* wireless charging pad 1* type a receiver 1* type b receiver 1* usb c receiver 1* wireless iphone receiver warranty: It is life-time quality warranty. When you get defected charging pad, you can ask for a replacement at any time. Note: While charge your phone, pls. Remove your phone pretective case . If you have any questions about this product by Elecasport, contact us by completing and submitting the form below. If you are looking for a specif part number, please include it with your message.